"When the final bandages came off we breathed a collective sigh of relief." Not only is this little dog naturally cute as a button, her sweet personality can hardly be contained by her 5-pound frame. But, sadly, in the eyes of her former owner, the Maltese mix's white fur was apparently not quite perfect enough. And, in a misguided attempt to change it, the pup nearly lost her life. This week, rescuers from Florida's Pinellas County Animal Services shared a heart-wrenching story about the dog, named Violet, and the botched makeover that almost killed her. When she first arrived under the shelter's care last year after being picked up as a stray, Violet was in terrible shape. 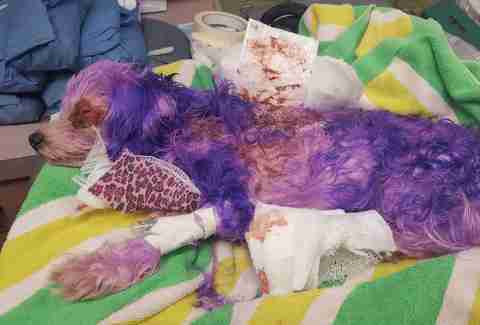 She'd been dyed purple using a chemical coloring intended for people, and, as a result, was left with severe burns across much of her body. One of her eyes was also swollen shut. It wasn't clear at first if Violet would even survive. "We gave fluids, pain meds and we gently washed as much of the chemical dye off as we could. 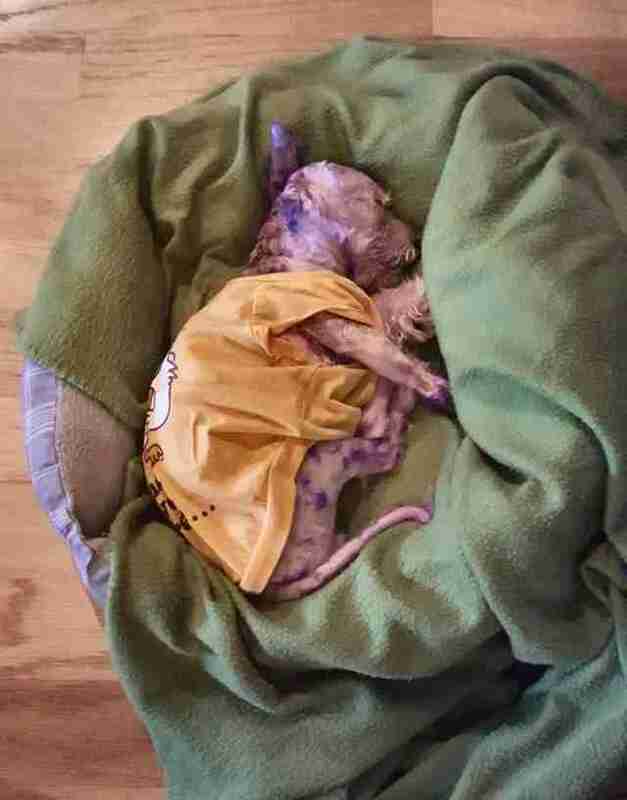 We bandaged her up," the shelter wrote in a post online. "Then we waited. Violet went home with our veterinarian and we waited." Thankfully, Violet had survived the night and was in brighter spirits by the morning, but her body was still reeling from the harsh dye. Soon her rescuers realized the full extent of the injuries that had been caused. "We began the arduous process of shaving off her hair to really measure the damage — [and] to our horror her skin began to slough off," the shelter wrote. "Good thing Violet was peacefully anesthetized. 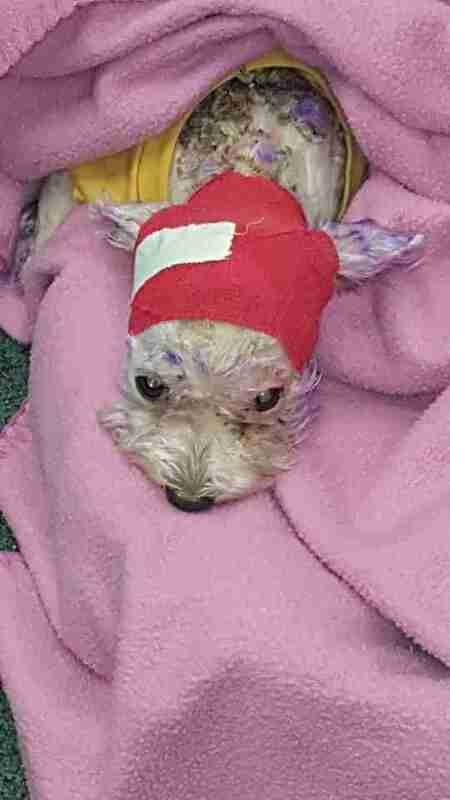 It was so much worse than we initially thought — how would this little dog make it through?!" But Violet turned out to be a fighter. Over the next three months of treatment, Violet slowly but surely began to heal — revealing a little more of her sweet personality each day. 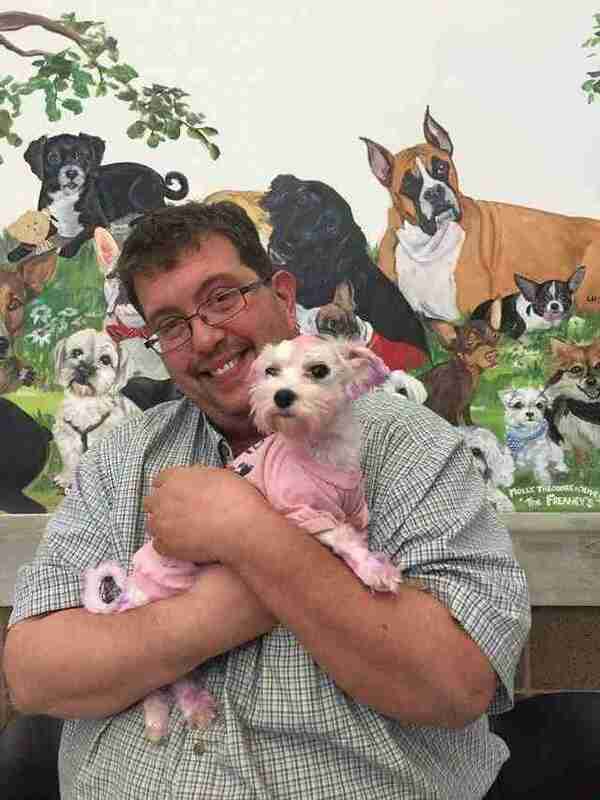 "She began to walk the halls, visiting each office requesting treats or hugs or gentle pats, always in the lead with our veterinarian in tow," the shelter wrote. "It was clear — Violet was on the mend and she wanted everyone to know it." "When the final bandages came off we breathed a collective sigh of relief," the shelter wrote. "Violet was beautiful." 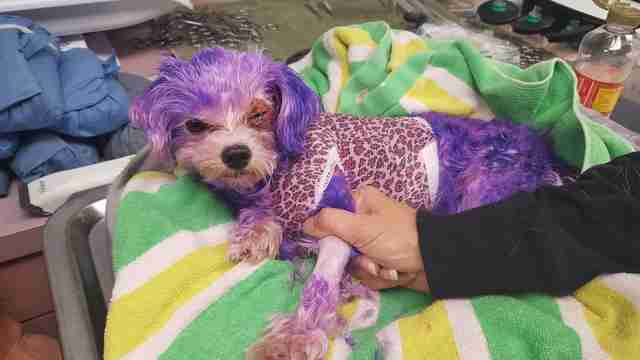 The dog's fur is still speckled with remnants of the dye, and her skin is still scarred in places from the burns she had suffered. But after that long, painful ordeal, she was finally ready to move on to the next stage of her life as a cherished pet. Violet, in the end, was adopted into a loving home. 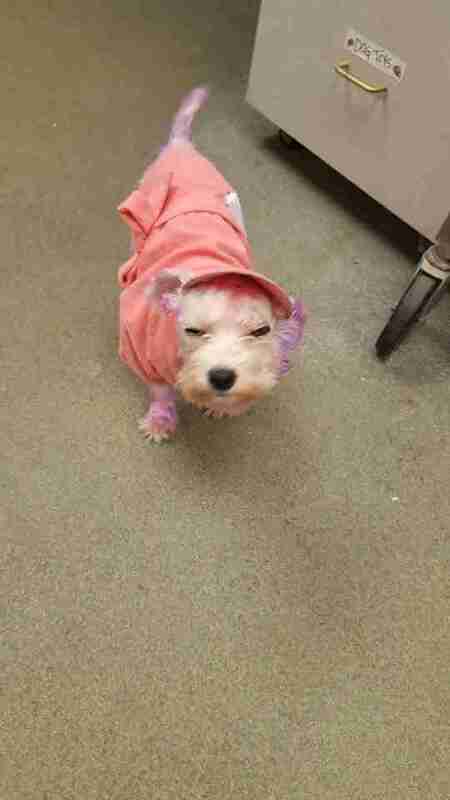 "Do not, under any circumstances, use hair color intended for humans on your pets," the shelter wrote. 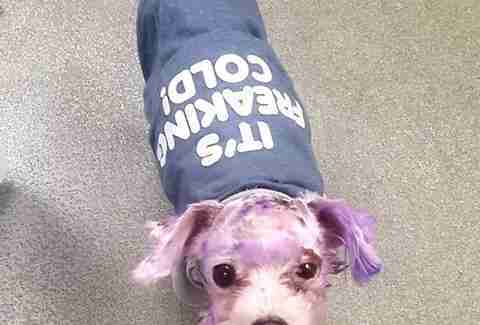 "Chemicals in hair dye are toxic, causing a wide array of external injury to your pet — possible burns, blindness and, because an animal’s first instinct is to lick, it can cause poisoning or internal burns. Just don’t."